Metallica had a big night at the Fillmore in San Francisco last evening (5 December) for the first of four intimate shows they're staging to celebrate their 30th anniversary. The audience, a jam-packed mix of fan club members, friends and celebrities, were treated to a party that lasted six hours. 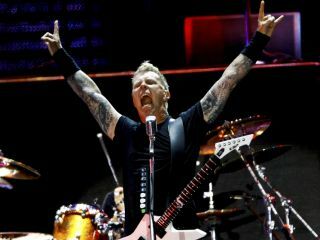 Amid all of the special guests, videos, comedy bits and a whole lot of Metallica on stage, there was something more: the debut of a previously unreleased song from the Death Magnetic sessions called Hate Train. Metallica performed the song last night and e-mailed the rough mix of the recording to fan club members. You can check it out above. Another highlight of last night's show was the appearance of bassist Jason Newsted, who quit the band in 2001. According to Rolling Stone, Newsted was introduced by James Hetfield as "someone who lived with us, and toured with us and did stuff with us for 14 years." Newsted performed Harvester Of Sorrow (right beside his replacement, bassist Robert Trujillo), after which Hetfield asked him to stay for a second song, Damage Inc.
Three more shows to go.